Singapore Press Holding is changing. Whether it is actions lead by new CEO Ng Yat Chung or previous management, the approach now seem to be morphing it into more of a property based business. I thought why not take this opportunity to take stock whether there is some value in SPH. So I will try to value SPH, and if you wish to learn, I hope this article helps. 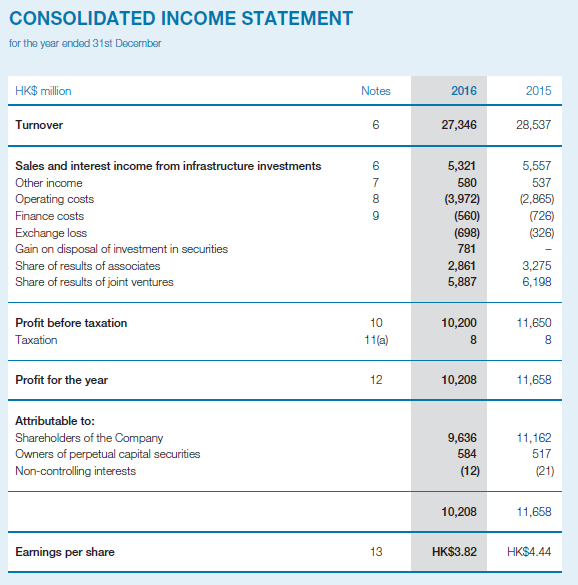 SPH just announced their 2nd Quarter Results so lets take a look. Before we start, its good to pick out the following figures, as we will need to reference them often. Majority of the figures can be obtained through the annual report, quarterly financial statements, or main stock websites. SPH is a business that we relatively know what it is about. Thus the first step to know if we can do more homework about it is to understand roughly where is SPH price, relative to its valuation. The first thing to explore is what kind of valuation metric should we consider using. SPH is made up of 2-3 segments of business, some that contribute cash flow, others based on asset value and some not performing consistently yet. The sum of parts valuation (SOTP) makes the most sense. With the sum of parts, we break down the valuation to each segments. Some of the parts, we can assign an appropriate price earnings, free cash flow yield, then find the asset value. For another part we can use the cap rate or plainly use the market asset valuation. We can then decide what are the current intangibles that are non contributing yet and decide if SPH is attractive enough. If we go to the annual report’s segmental information in the notes section, you can see how SPH breaks down their segment. From the description above, the breakdown to each segments can be a bit ambiguous. Where would their 22% stake in MindChamps and their Stake in Perennials be? Where would their $164 mil purchase of healthcare group Orange Valley be? Where would their stake in M1 be? This is the complexity of doing a sum of the parts valuation and what we sought to find out. The media business is in a declining mode. The idea is that this is a segment that the government would want to have around. However this could start bleeding pretty badly. When that happens, the likely scenario is that the government will privatize a loss making business that is hard to sustain as a private business. Given this, it is important to model a few scenario. Would this business reach a terminal profitable state? If it is what is the state it will be like? The 2016 to 2017 results show nearly a $100 mil decline in revenue for the Media segment. The Media and Advertising business have so much operating leverage. 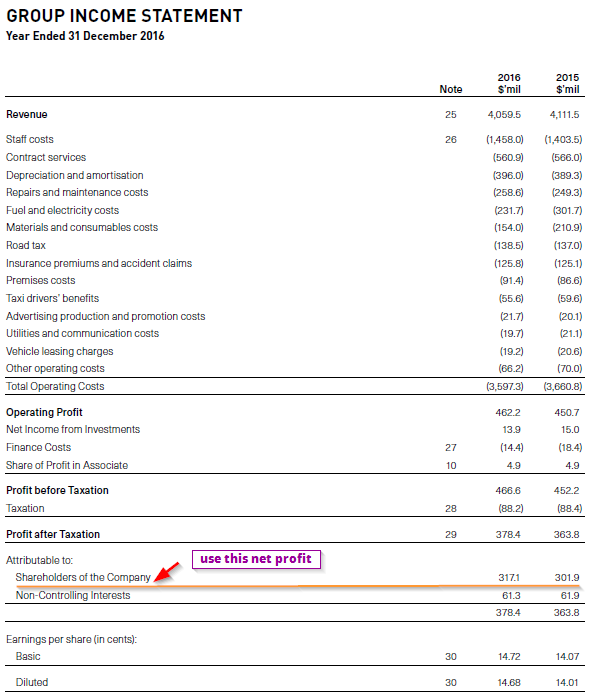 A $1 in revenue after the fixed cost goes straight into the operating profit. However, in this case, the operating leverage actually worked against SPH. 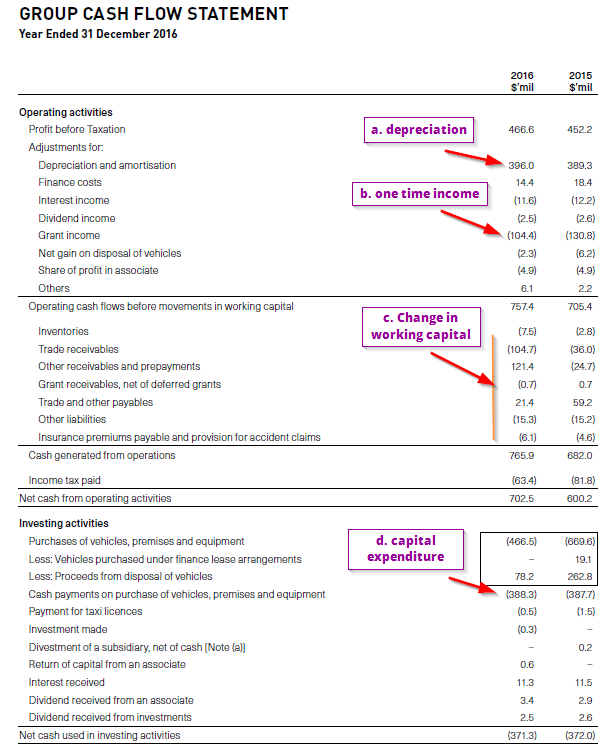 Because the cost does not go down equivalently when revenue decline, all the revenue fall hits the operating profit. They also took a $35 mil impairment in 2017. Profit before taxation fell from $175 mil to $26 mil. That is massive! We would like to see in this upcoming year whether there are any improvements in this segment. In 1H 2017 to 1H2018, we see a decline in revenue of $41 mil from $372 mil to $331 mil. 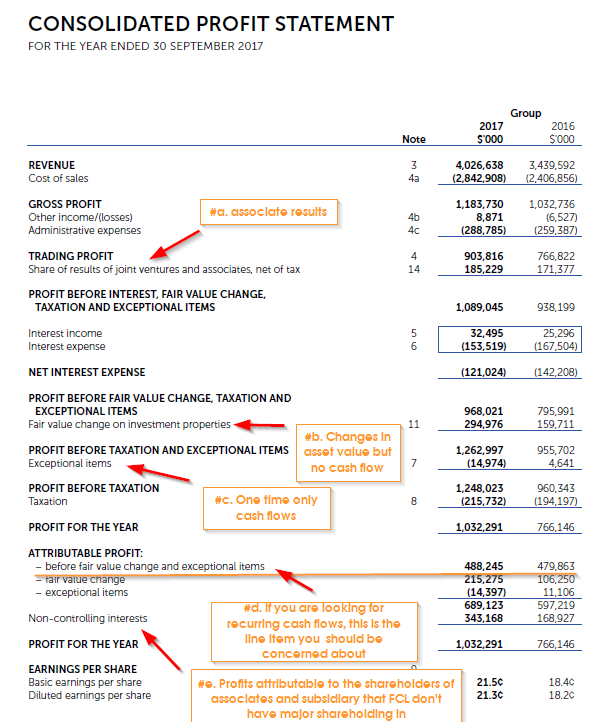 Profit before taxation for 1H fell from $50 mil to $40 mil. 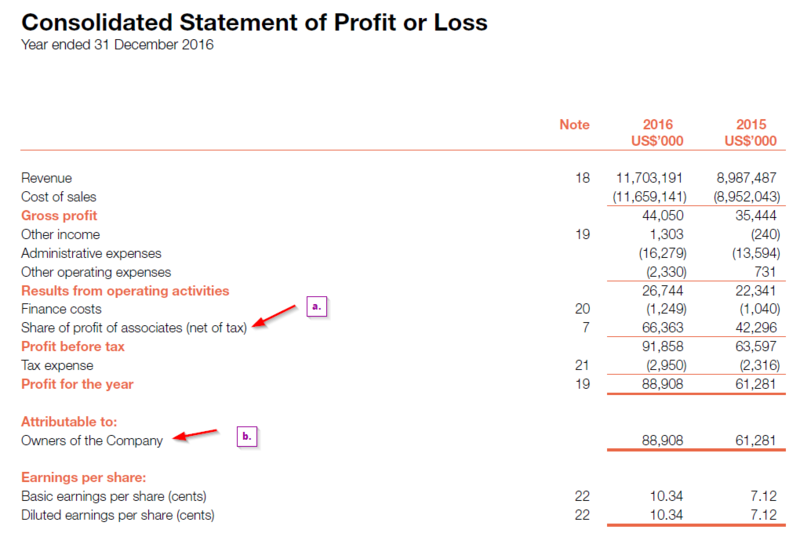 I do not know the trend of the profit fall for the media business so I took a look at one more 1H 2016 results. It seems the fall was from $102 mil to $50 mil to $40 mil. It does show signs of slowing down. In 2017 first half, the Media business earns $50 mil. Revenue fall was proportionate. In 2017 full year, the Media business earns $62 mil. In 2016 first half, the Media business earns $102 mil and full year it earns $175 mil. Revenue fall was proportionate (not shown in this article). Some how I am not so incline to say that in 1H 2018, the Media business earns $40 mil, therefore we estimate that full year 2018, the Media business will earn $80 mil. It seems in 2017, more of the earnings come from first half of the year. Either that, or that in 2017 the decline in revenue was so drastic. That amount is more than the $62 mil PBT SPH earns in 2017 and business is declining. 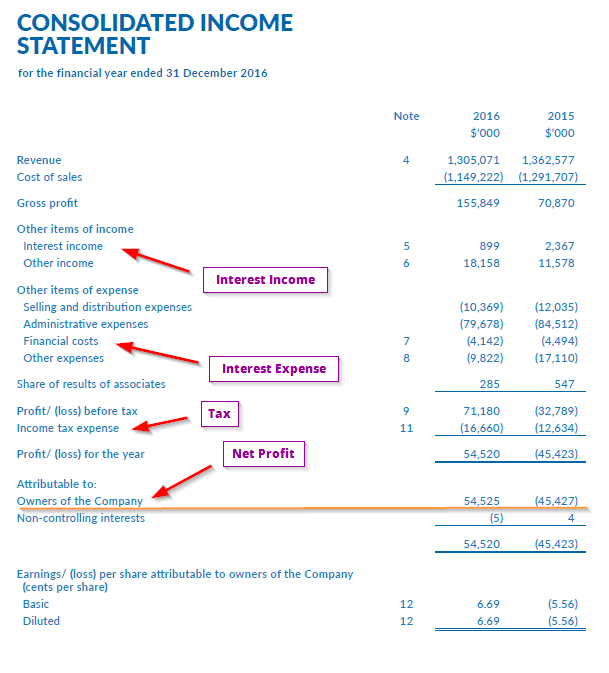 Suppose I estimate that 80% of SPH’s Media business profits come from 1H, that would peg the full year 2018 media profit before tax to be $40 / 80% = $50 mil. If I were to purchase the Media business as a standalone, how much would I purchase it at? 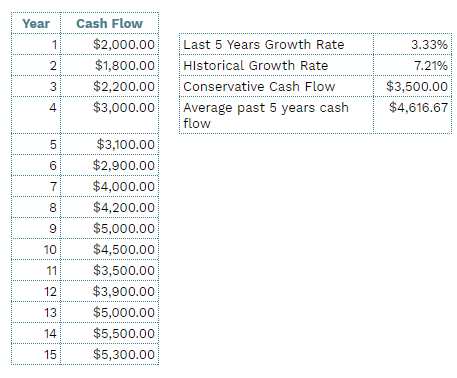 If #1 and #2 are visible, I can accept a 10% to 12% earnings yield, if the model is not dying. 10% earnings yield inverted is 10 times PE. 12% earnings yield inverted is 8.3 times PE. The rough intrinsic value of the Media business is $400 to $500 mil. This is like 10-12.5% of current market cap. 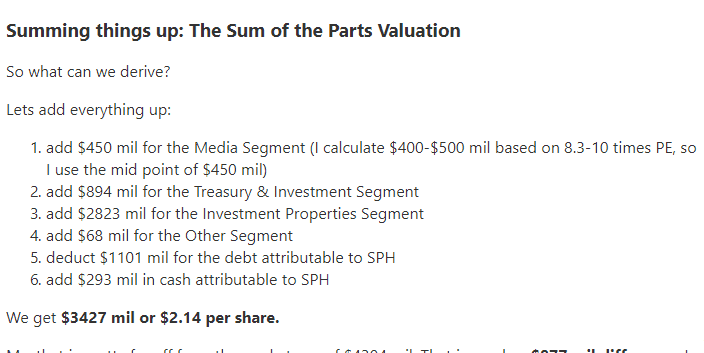 As per the quarterly report, SPH have a net asset value per share of $2.14. That puts the price to book value at 1.16 times. It looks pretty close to book value. Normally in the past, we would not put high priority to using price to book to determine the relative valuation of SPH. This is because it was essentially a print and advertising business, and less of a holding company & property business. A large part of it was high return on investment or asset. Given this if we break it up, assigning an appropriate price earnings, earnings yield, EV/EBIT or EV/EBITDA would be more appropriate. However at this point, SPH is more dependent on the property business. Having some respect to price to book is not wrong. When we go through this exercise, we are trying to see at current point what is the business selling at and based on the cash flow or asset value, whether its a good deal or not. We are also trying to model what would be a conservative way to value SPH so that when we purchase it, there is a margin of safety. SPH, like a lot of those blue chip companies was a rather big conglomerate with a lot of business that might not be related. They used to have Belgacom, a Belgium telecom company for example, before they divest it. Right now, the prominent one are their stake in M1 Limited, the local Singapore telecom company. The good thing is that these assets are held on SPH balance sheet as Short term and Long term Investments and Asset-held for Sale. 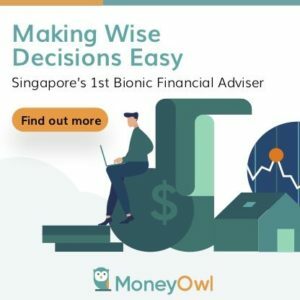 Since these assets are computed based on fair value (their value is frequently recalculated and recorded in the balance sheet, instead of at cost), it makes our job easier. The non-current available for sale assets is worth $513 mil and the short term ones is worth $363 mil. There is an additional $18 mil in asset held for sale. SPH do own a lot of properties, however some of the properties such as Media Centre and Print Center are used by their Media Segment. 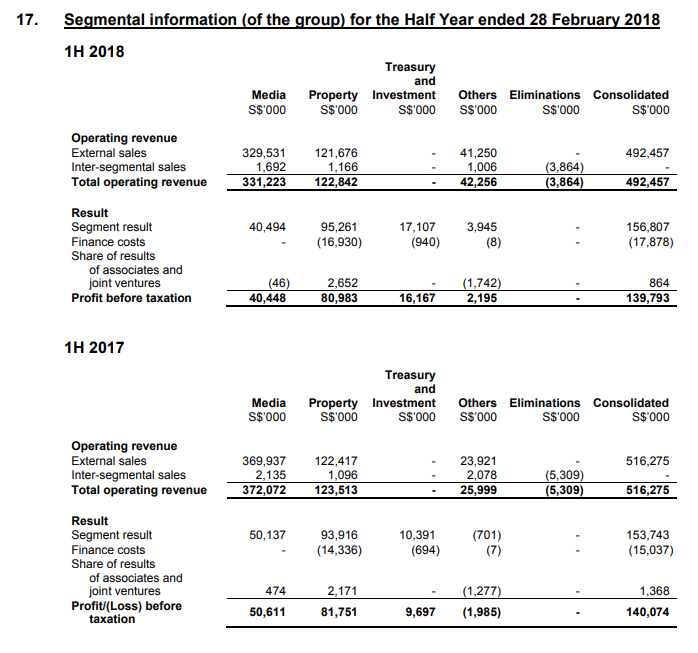 Since we are already valuing the Media segment using price earnings, thus valuing it by cash flow, we cannot include this under their property segment. 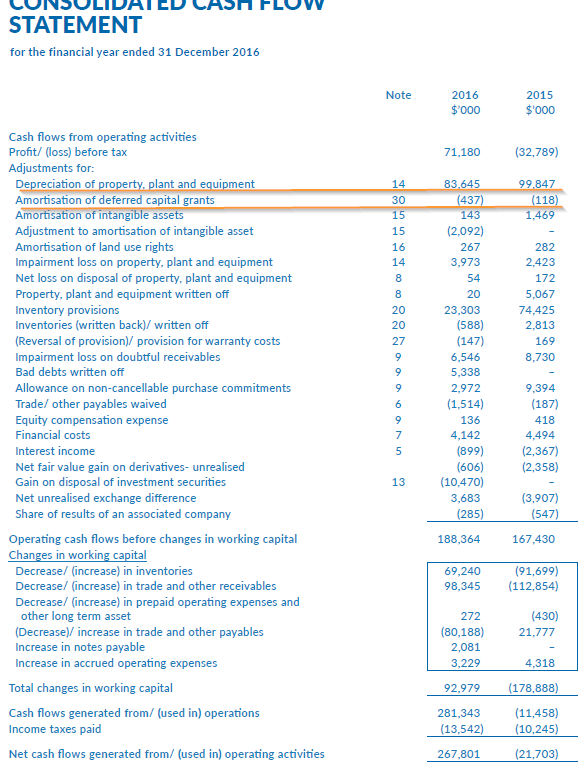 From what I see on SPH’s balance sheet, they have $4034 mil in investment property. This is likely to be Paragon, Clementi Mall and Seletar Mall. SPH owns 70% of SPH REIT, which in turn owns Paragon and Clementi Mall. They also own 70% of Seletar Mall, with United Engineers owning the other 30%. Since SPH owns more than 51% of these investment properties, they account 100% of these malls’ profits and asset value, debt value on SPH balance sheet. Thus, it might be easy to take only 70% of the investment properties’ value. This will come up to $4034 x 0.70 = $2823 mil. In #3, we value the investment properties by their investment values. What we have not included is SPH’s role in managing SPH REIT. SPH earns a recurring management fee for managing SPH REIT. How much is earned currently can be found in SPH REIT’s annual report. 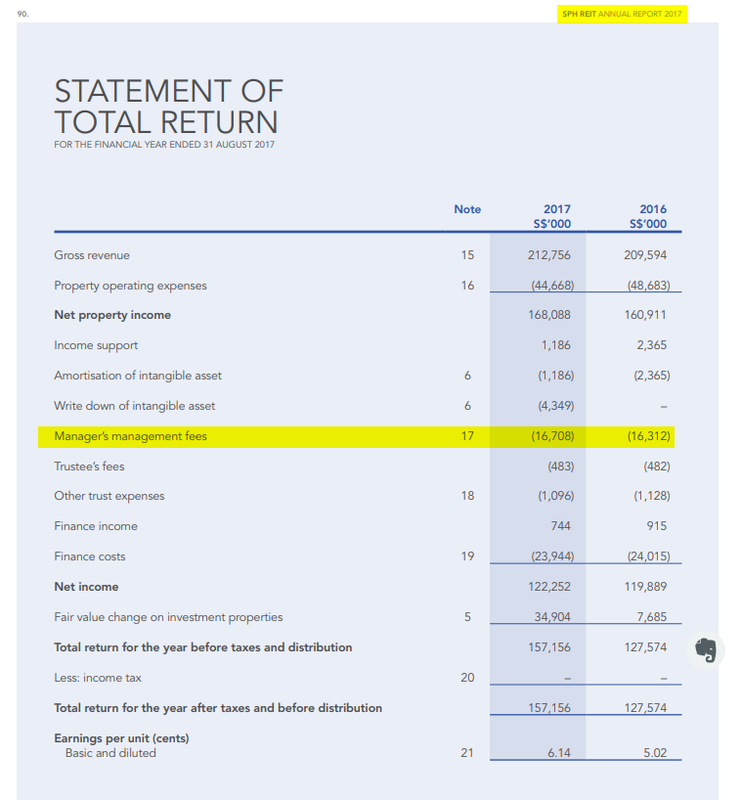 From the statement of total return in SPH REIT, we can see the manager earns $16 mil on a recurring basis. 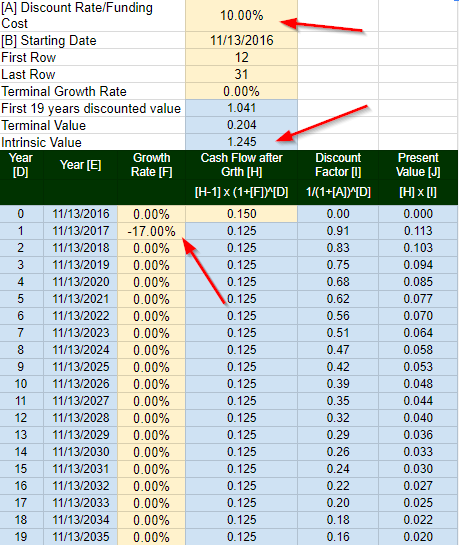 Thus, we could probably use discounted cash flow or number of times price earnings to value this portion of the business. But how much could we pay for the manager? In an older article, we discussed Croesus Retail Trust’s Internalization of their REIT manager. You can read about it here. The conservative valuation should be around 3.8% of AUM and 10 times SPH REIT’s management fees. Honestly, given the predictability of this business, we could pay 15 times management fees for it. But lets be conservative, and value it at $16 mil x 10 = $160 mil. 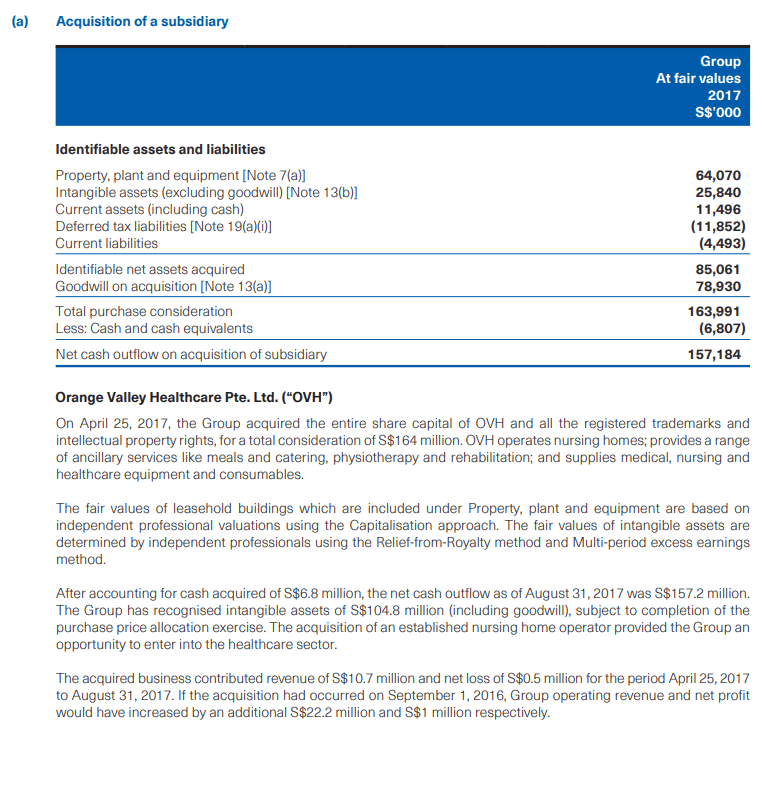 Currently, SPH REIT have $3278 mil worth of property under management. In 2018 Apr, SPH REIT announced that it will purchase The Rail Mall for $63 mil with debt. This will bring future assets under management to $3341 mil. 3.8% of 3341 mil is $127 mil. That is about pretty close to $160 mil. We could take it that the Property management function be worth close to $150 mil. 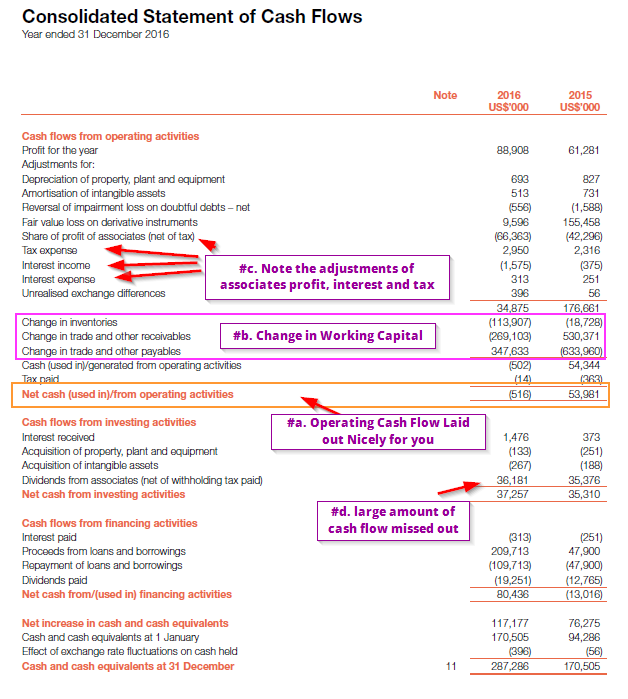 Now that we have worked out the rough value of the Media, Investment Property and Treasury & Investments segments, we have to deduct away the amount of debt and add the cash holdings on SPH balance sheet. Just like the investment property assets, the job is complicated due to some of the debt is owned by non-controlling interest at SPH REIT and Seletar mall. I find #1 to be tougher, because we have to itemize more. With #2, it is easier because SPH REIT is listed so we can have an easier time to find out. In the notes section of the annual report, the report goes into detail on the debt. 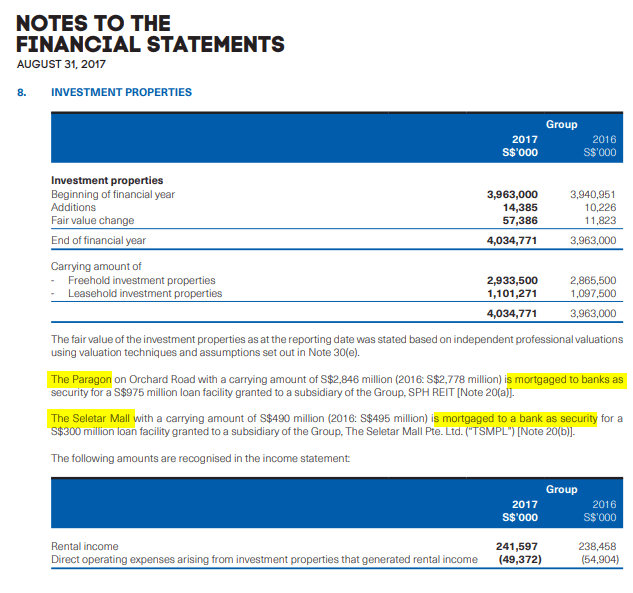 From SPH REIT’s annual report, we know that their debt is $848 mil. 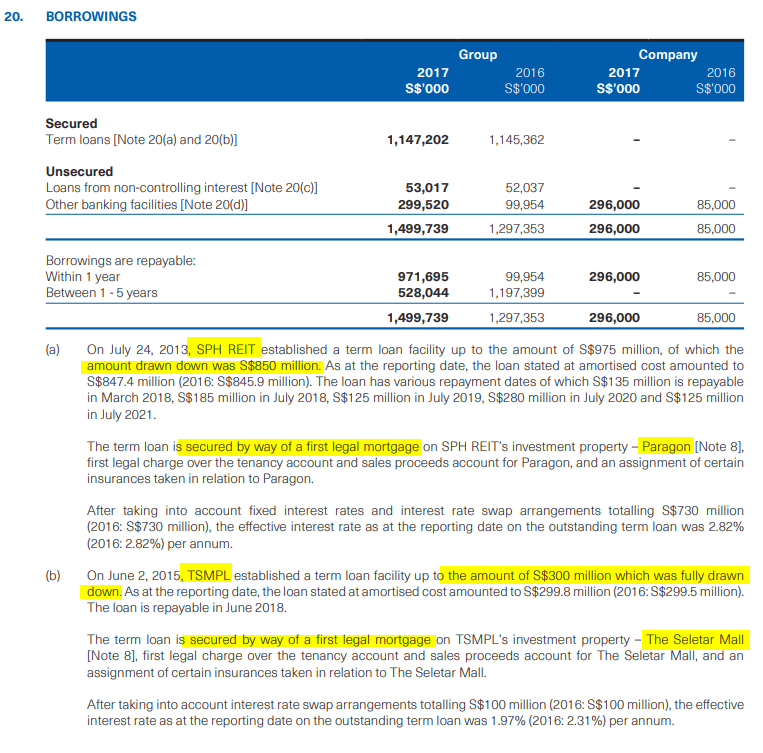 This coincide with note 20a above, where they say SPH REIT’s debt is secured with Paragon. 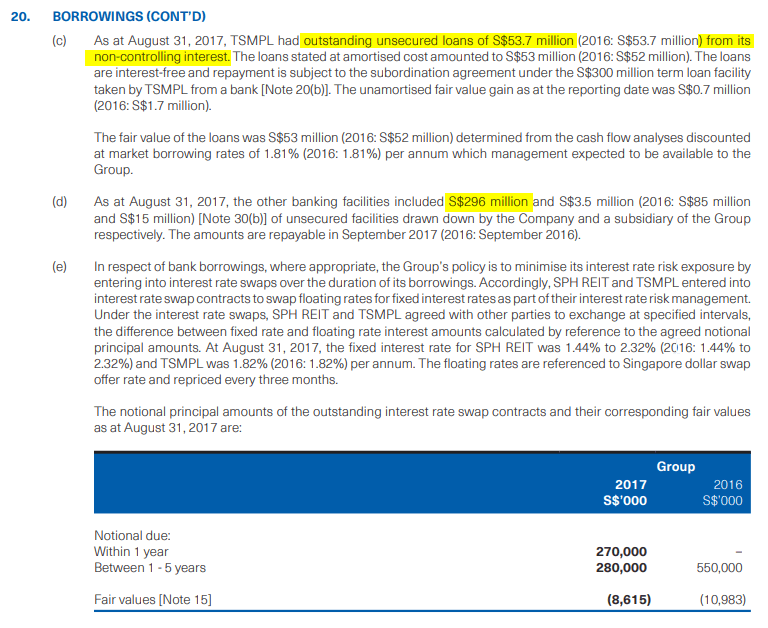 Note 2b shows us that $300 mil is attributable to Seletar Mall, with Note 2c stating that $53 mil is attributable to Seletar mall’s non controlling share holders. Thus we can compute the debt attributable to SPH to be $1499 – $848 x 0.30 – $53 – $300 x 0.30 = $1101 mil. 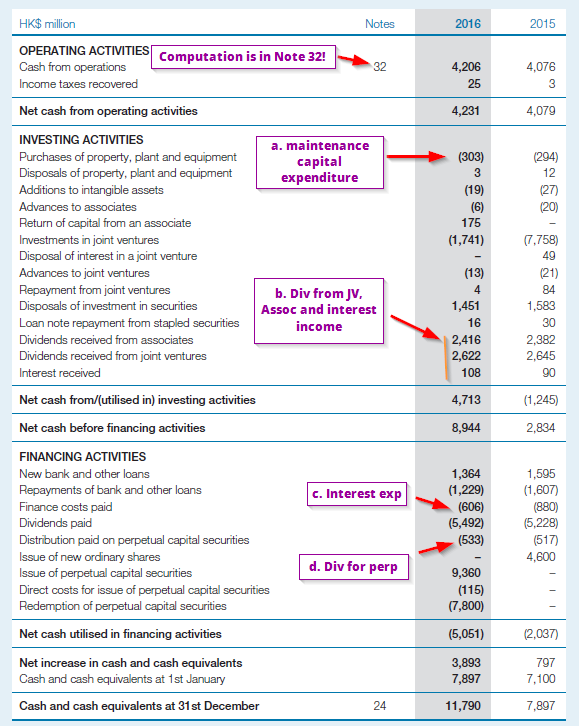 From SPH balance sheet, SPH have a cash and cash equivalent of $312 mil. 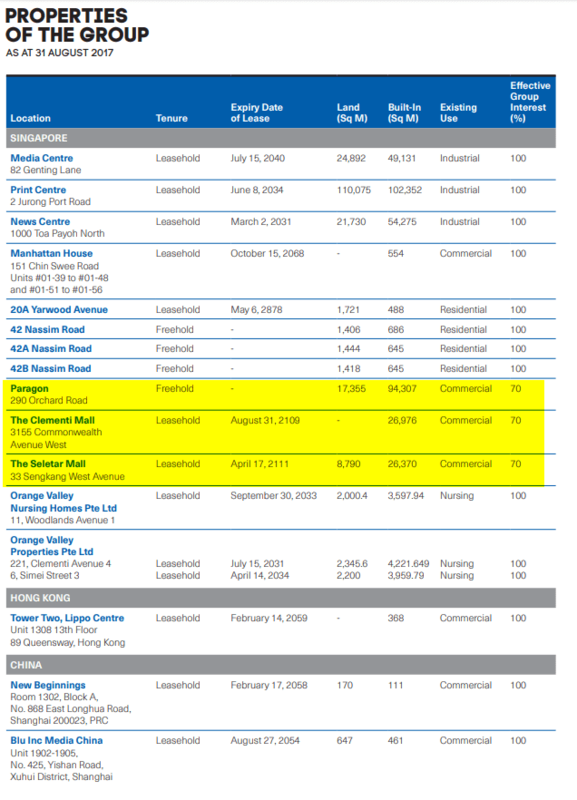 We know SPH REIT has $63 mil in cash but not sure about Seletar Mall. But since we can’t do much about Seletar mall, we can deduct the 30% non-controlling cash of SPH REIT from SPH total cash. Thus SPH’s cash and cash equivalent is $312 – $63 x 0.3 = $293 mil. Other than these 3 main segment, SPH have been buying many businesses and starting healthcare and property business. This can be quite a mess. We can include the property development business if we know more details. However, a lot of their other businesses can be accounted under treasury and investments, associates or joint venture. 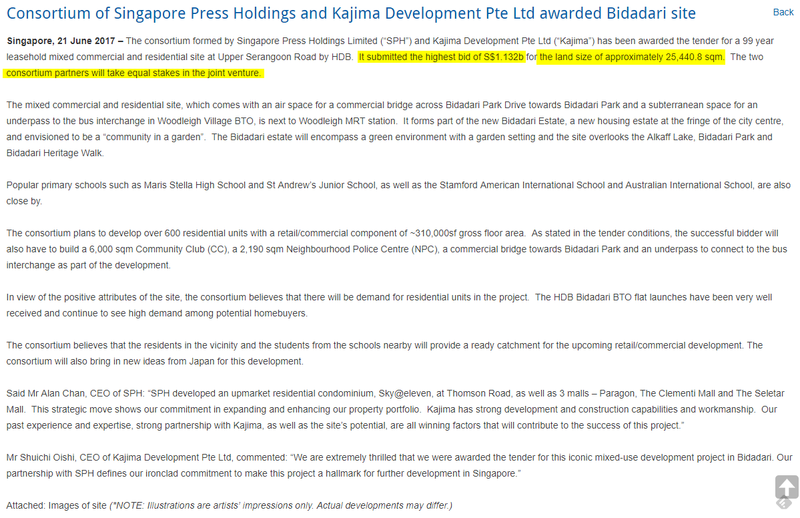 #1 includes their 22% stake in Mindchamps and 27% stake in Perennial Chinatown point. #2 includes a joint venture in which they are awarded a land development deal to develop a 99 year leasehold mixed commercial and residential site at Upper Serangoon Road at a tender price of $1132 mil. SPH commitment is $168 mil with an outstanding commitment of $454 mil. This should be their 50/50 joint venture at Bidadari. There is good potential that they get to manage the commercial and retail mall, but there is absence of details. At this point we will value #2 as zero value. #3 includes a goodwill of $129 mil and technology, trademarks, licenses of $74 mil. They impaired 26 mil in goodwill in 2016 due to poor magazine business and 19 mil in 2017 due to online classifieds poor performance. Goodwill records the above market price purchase of subsidiaries, associates. It is of value if SPH value enhance and these subsidiaries and associates can be worth more than their purchase price. Since this is so subjective, and SPH have been impairing goodwill by quite a fair bit, the safe assumption is to assume that #3 is zero value. In 2017, SPH spent $164 mil to buy Orange Valley Healthcare to kick start their elder care healthcare business. This could be substantial in the future. Normally we would value the healthcare segment based on cap rate, discounted cash flow or how many times the EBITDA. However, because it is at its infant stage, we can’t really tell the cash flow generation, so we will take the value of this at asset value. 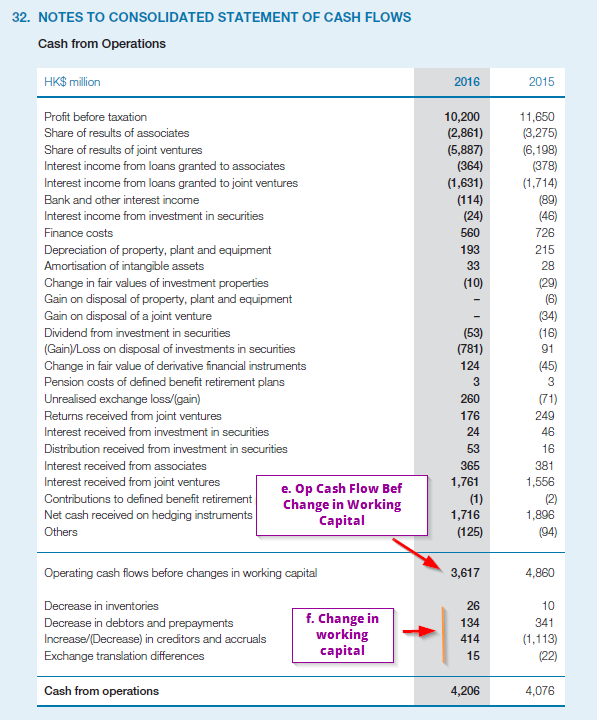 From the above part of the annual report, we can see that SPH eventually paid $157 mil as cash outflow for it. 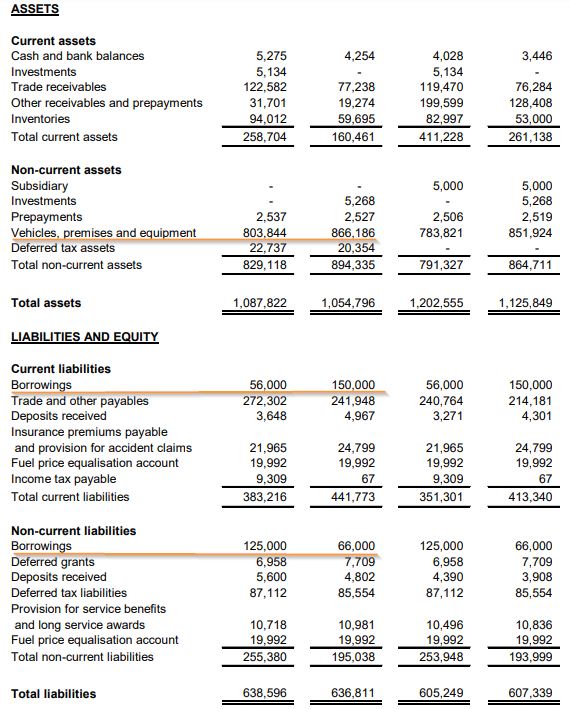 On the balance sheet, this is accounted under property, plant and equipment and intangibles (excluding goodwill) ($85 mil) and goodwill intangible assets ($78 mil). There are substantial goodwill paid for Orange Valley, and SPH is expecting that they can grow the healthcare business such that those goodwill eventually becomes real tangible value. So how certain are we that this would happen? At this stage it is difficult to assume that. I would be comfortable to say that 30% of the $78 mil in goodwill to be realistic. I would add $85 mil + $78 mil x 0.30 = $108.4 mil to the sum of the part valuation. As a summary, under Other segment we add $68 mil in associates and $108.4 mil in Orange Valley to the overall sum of the part valuation. So what can we derive? We get $3685 mil or $2.30 per share. My, that is pretty far off from the market cap of $4304 mil. That is nearly a $619 mil difference. I might have made a mistake in my sum of the parts computation, or that I am very conservative in my valuation. 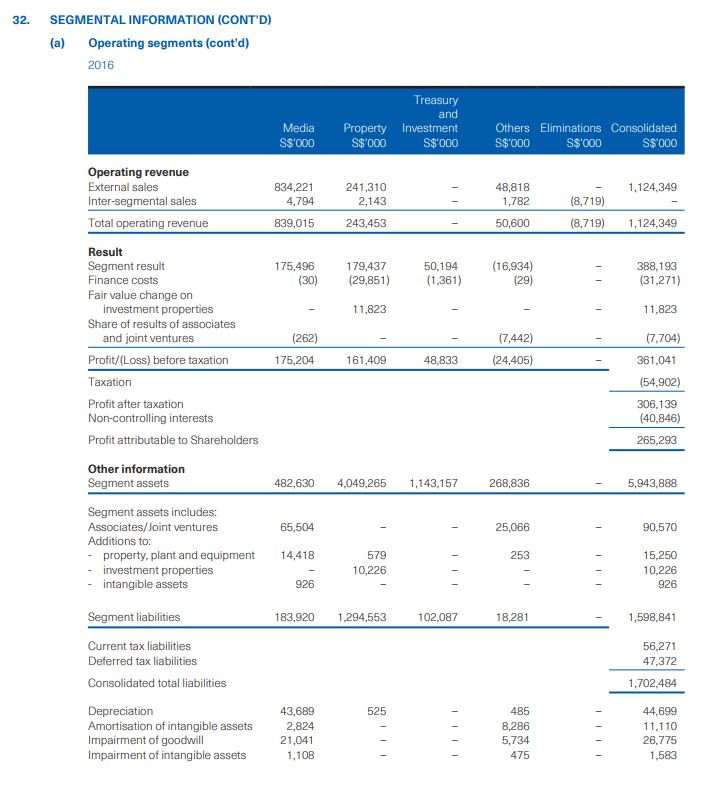 The conclusion seem to be that SPH is trading at 14% above my computed intrinsic value based on conservative metrics. Let me know if you guys came up with something else. I share my Experiences & Reflections in Active Stock Investing, Prospecting Stocks & Businesses in my Section on Active Stock Investing here. Do Read this if you are interested. SBS Transit currently has a market capitalization of $802 mil with 311 mil in outstanding shares. This is one company that I have invested in at $1.30-$2.00 in the past. The story is panning out, not exactly as what I anticipated, but its close enough. There were much focus on the selling of the bus fleet back to the government but in my opinion, the attractiveness of SBS is to return to the situation in 2000-2001 time. Back then, SBS have manageable capital expenditure and was able to pay a very controlled 5% dividend yield. When the bus capital expenditure increases to a new normal, they have a problem there. A move to the government contracting model will be able to move all these off their financials. They still have the costs which are indexed to inflation, but they are not subjected to fuel cost fluctuations and capital expenditure needs. This means the government can charge you and me $0 for our bus fare and SBS will still be profitable. 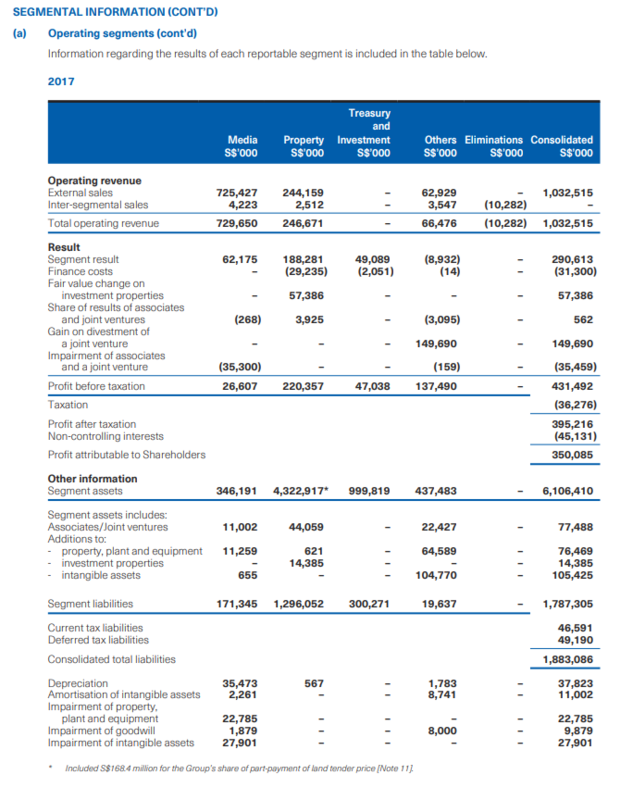 SBS Transit’s income statement looks much better nowadays. The earnings yield (47 mil / 802 mil) is 5.8%. In my opinion that earnings yield is not bad. 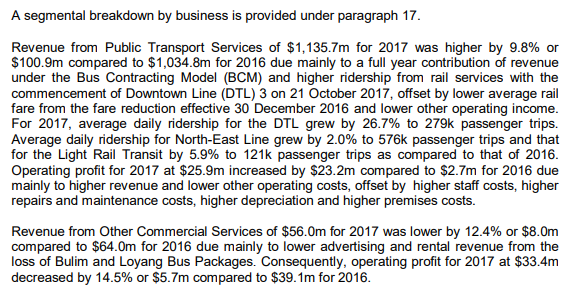 We got to give ourselves a pat on the back as we try to deconstruct how much SBS would earn based on operating margins of 5%, 6%, 7%, 8%, 10% and look at what overseas public bus operators like Go Ahead and Tower Transit earned and came to a close enough figures. These operators won’t come in to compete if they don’t think there are no money to be made. However, my sensing is that public transportation is in the public eye and these financials are out there in the public eye. This means that the government won’t want to give a contract such that it is so lucrative that it becomes a public discussion. 5.8% is pretty good if this is a business that won’t be disrupted, have monopoly power and can go on for along time. Under the GCM model, each bus parcel is a concession for different duration with the earliest probably expiring in 1 years plus. Then it is up for tender. What this means is that there runs a risk of SBS winning less or more bus parcels. In contrast, the concession for the rail operation, NEL and Downtown Line are more than 10 years. There are justifications why ComfortDelgro share price took a hit when it was announced they did not win the TEL operation. In my opinion, the concessions are short and these stocks are trading at 5.8% earnings yield. Now to the balance sheet. 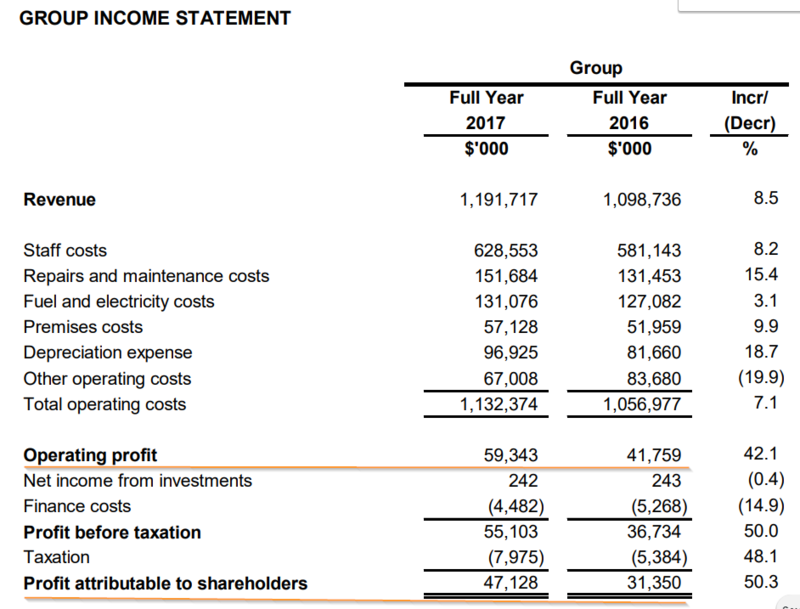 From the income statement, SBS have lower financing costs. From the balance sheet its been observed that its dropped from $216 mil to $181 mil or about $35 mil. They took on these debts for capital expenditure and one of my guess is that if they manage to sell the bus fleet back to government at book value (this guess was wrong, government leased from them for a fee as you will see in the cash flow statement) they will repay all the debt and they will be net cash. This seem to be happening in a different way. In 2017, there was no more grant received (78 mil) coming in. This could be the 64 mil change in working capital. This grant is likely the payments by government to lease the bus assets under the GCM model. 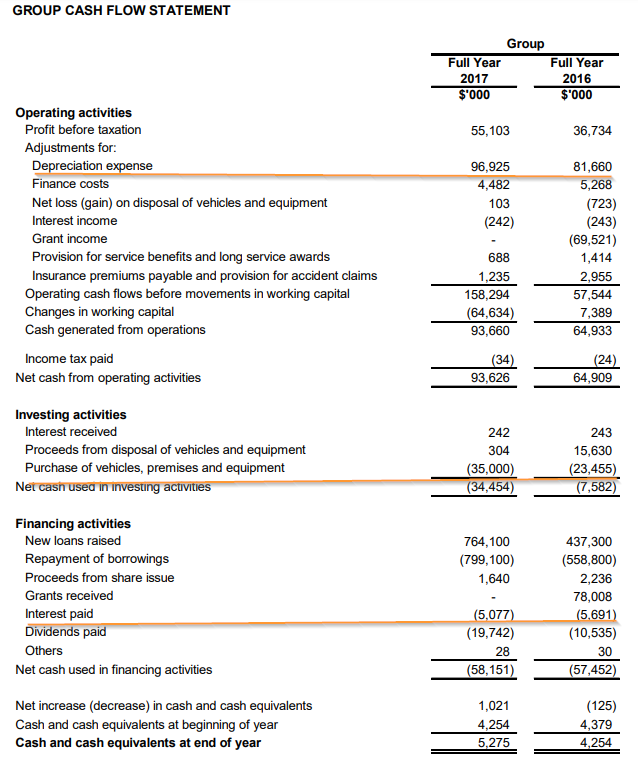 If we compute the free cash flow, which includes the interest paid and grants received, it improved from 106 mil to 118 mil. The enterprise value of SBS currently stands at $978 mil. This gives a very high cash flow yield based on EV of 12%. The good news is that SBS is bumping up the dividends from a final $0.027 to $0.0395. The annualized dividend in this case to $0.076. The dividend yield based on the share price of $2.62 is 2.9%. 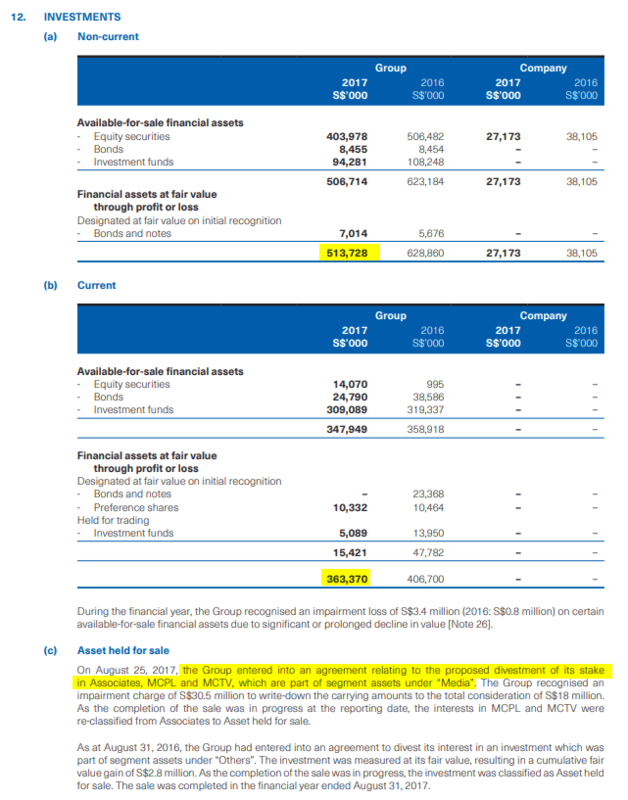 To pay out this dividend, SBS would need $23.6 mil. This is a 50% net profit payout ratio which is conservative. In valuing companies, it is difficult to say a company is worth $X. We try our best to approximate it. SBS looks to be a concession business that is restricted by the government policies where they operate in. There are downside and upside risks of them getting more concession contracts (whether its bus or rail) or less. Thus, it is not a business that will produce cash flow to infinity. 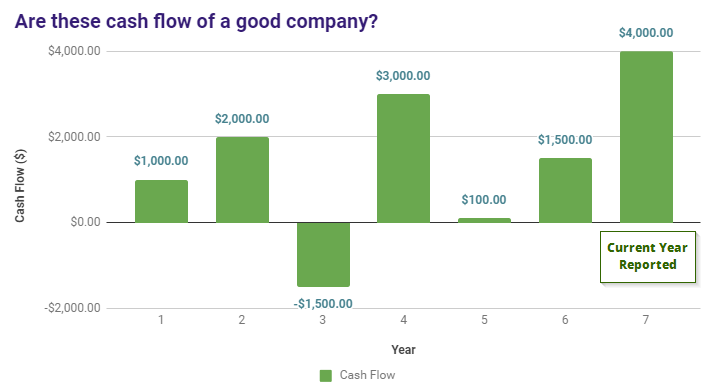 From the free cash flow perspective, it looks very attractive but that is only because there is an expiry to the concession. A better way to look at this is to estimate the cash flow for these 10-20 years, and then do an XIRR to see if its attractive. A rough gauge will be based on the earnings yield of 5.8%. This ranks it higher than SIA Engineering and SATS in attractiveness. However, my reservations at this point is that SBS seems to be more dependent on each individual parcel wins, or MRT contracts then the more predictable nature of SATS business. I think SBS is fairly priced at this point. The upside surprise would be that the nature of DTL’s contract allows SBS to earn in a similar manner to NEL. I have this believe that DTL’s rail contract, which takes its cue from the one issued to SMRT, have limited up side and downside potential. Back when ComfortDelgro’s share price was around $2.04, I wrote a comprehensive analysis about it. 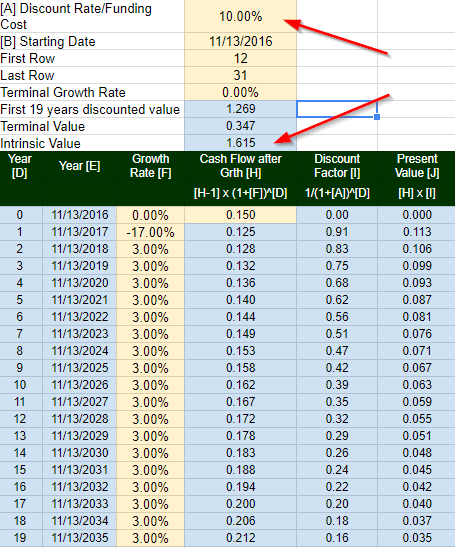 In the article, I went through a few rounds of discounted cash flow to see at current earnings, cash flow scenario, what is the estimated intrinsic value given the growth rate and the discount rate. 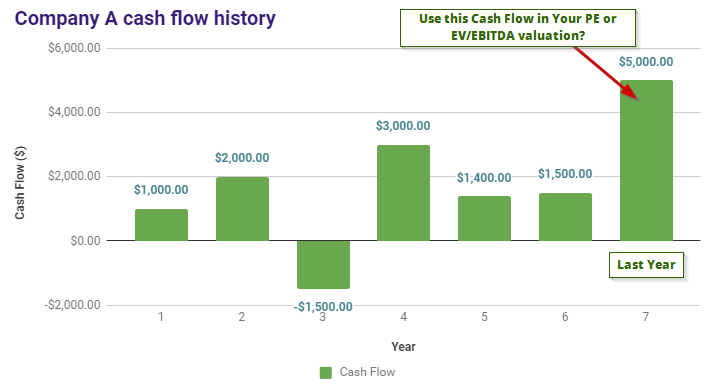 I also did a reverse discounted cash flow on it. I think not many people delve deep into the figures except for probably a few. It needs a friend who dives deeper to be able to tell me that somehow my calculator seems to be wrong. And it is indeed wrong. This is what you get when you try to do DCF at 4 am in the morning. So here are the recomputed figures. The first DCF takes into consideration my estimated growth (or negative growth) due to how competition will render their Singapore Taxi division. The discount rate is a conservative 10%. The terminal growth rate is 0%. We arrive at a valuation of $1.245. This is some $0.20 below the original incorrect figure. If we embed a 3% growth rate for 18 years, with terminal growth rate to be 0%, we get $1.615. This is also lesser than the previous. 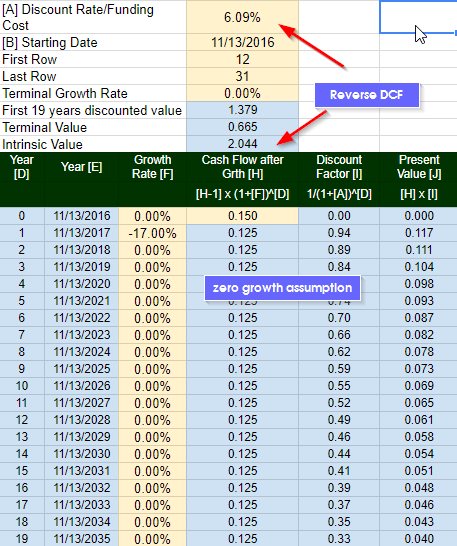 The last table shows the reverse DCF, where we try to see what is the discounted rate, based on the -17% growth and subsequent 0% growth. We get 6.05% instead of 7.5%. Given the current share price of $1.91, the discounted rate we get from reverse DCF is 6.50%. So what I said about CDG being fair valued around $2.00, that probably takes some beating. It looks slightly expensive at $2.00. Certainly, if we see a reverse DCF discount rate of 6.05%, it is not VERY attractive. It could be a good investment if the moat is alive and this business can go on for a prolong period. Never trust a financial bloggers figures fully. Especially if they did not sleep enough.